Ted was a founding partner of HHL Architects, established in 1969 in Buffalo’s eclectic Allentown district. He received a Bachelor in Architecture from Cornell University and continued with advanced studies at the Massachusetts Institute of Technology and Harvard University. Ted became a registered architect in 1964. In addition to his full-time practice, Ted taught senior and graduate studios for 25 years at the University at Buffalo, School of Architecture and Planning, and after continued to lecture throughout the region. Ted was an active member of the Western New York community, completing six years on the New York State Board for Interior Design. He served on the Buffalo Preservation Board, the Association for Preservation Technology, and the Scajaquada Pathway Steering Committee. He had also been a grant evaluator for the New York State Council on the Arts in the Architecture, Planning and Design program, the Capital Aid program, and the Getty Grant Program. 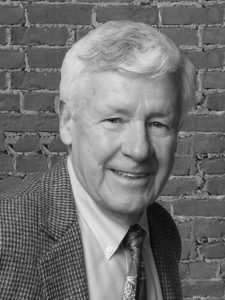 Ted continued to work at HHL Architects until he passed away in January of 2017, and is survived by his wife of 48 years, Olga Aleksiewicz; a son, Alexi; a daughter, Anya; and one grandchild.